Shildon AFC are beaten for the first time. Top of the league Shildon AFC suffered their first defeat of the season in the league after going down 1- 0 against 2nd place Morpeth Town on Bank Holiday Monday 31st August 2015, the goal coming with just one minute remaining. Shildon could easily have been 3 up in the first 11 minutes. In the 2nd minute a Kyle Fryatt electrifying run found Lewis Wing whose 20 yarder hit the top of the bar with the keeper beaten. A minute later Micky Rae had a great chance with a one on one with the keeper but his shot was weak. On 11 minutes Gary Brown fired just wide. For Morpeth, No 7 Sean Taylor had a brilliant chance but he shot over from 5 yards. As an evenly matched 1st half Morpeth looked far more dangerous in the 2nd and as the game went on they got stronger, with Shildon’s Gary Brown and Bobby Moore defending brilliantly. 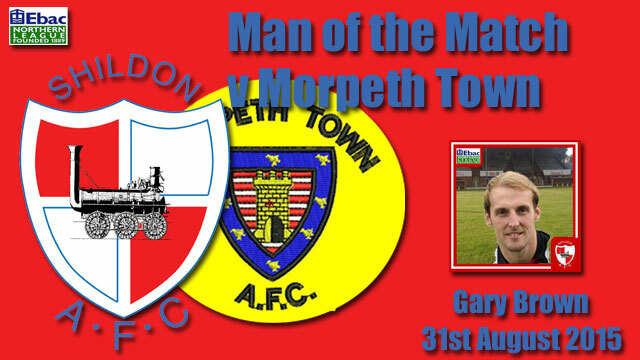 After 84 minutes Bobby Moore cleared off the line and after more pressure from Morpeth, Gary Brown also headed off the line, but Ben Sayer’s right footer sealed the win for Town on 89 minutes. Subs: Greulich-Smith for Rae, Doninger for Fryatt 63, Hudson for Davis 71. Shildon cannot have any complaints as the best team won. They were the only side threatening in the 2nd half.